If you like this item. Please tell your friends. Brighten up your Christmas with our new Personalised Christmas Stockings. These stockings are available in red only with a choice of three different embroidered designs on the body, and your name embroidered on the cuff. The stocking leg is made from luxury red satin, and is trimmed at the top with white fleece. The stocking has a white cotton tape loop to allow you to hang this on your mantlepiece on Christmas Eve. 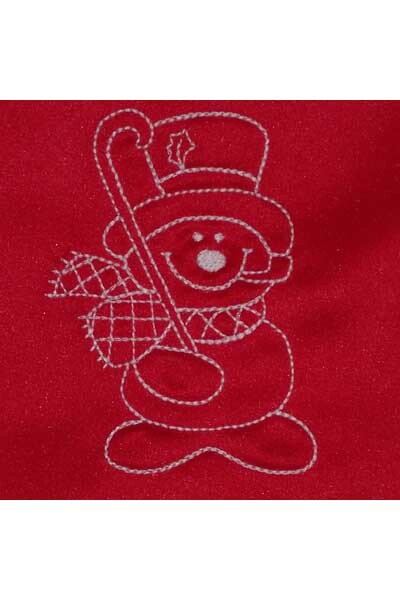 Please note this particular item is a Happy Snowman design. Please see HERE for our other designs. The stocking is 48cm from the tip of the toe to the opposite edge of the cuff. The circumference of the opening is 36cm. It will easily fit plenty of small gifts or even a 750ml bottle of wine or champagne inside. 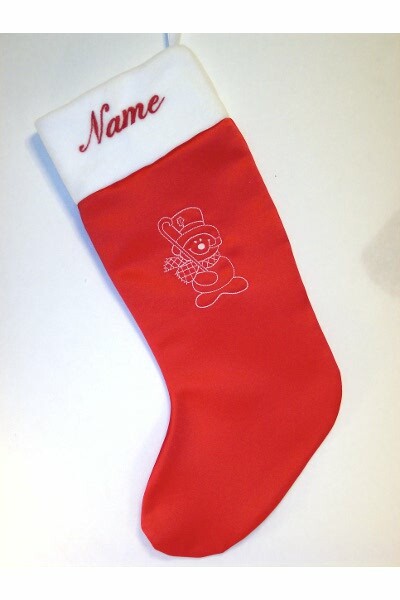 This item will be personalised with your name and our Happy Snowman design. We will also need the name you want embroidered on the cuff. Please note that longer names will need a smaller font to fit the name into the space. If you have any questions then please email us before purchase. Please make sure you read and agree with our Terms & Conditions before you purchase. If you wish to purchase this item, then simply click on the "Add to Basket" link below. You will be asked to enter your personalisation information at this time.